As you may (or may not) have noticed, I've been out of action on my blog for a little while, and I wanted to take the chance to apologize for this heinous crime, for I know you are all simply DYING to have my compelling/exciting/LIFE-CHANGING blog posts to keep you entertained. The reason for my cyber absence is that my laptop, poor ol thing, is in the shop at the moment being fixed. After four loyal years the poor girl is beginning to kick up a bit. 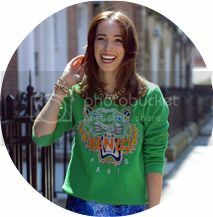 Im so sad at not being able to blog properly at the moment, and am missing it more than I care to admit! But not to worry folks, I'll be back in action soon enough, and have decided to use the little break to think of some new and exciting improvements for this humble blog of mine! Just a few changes that I hope will spruce things up a bit, and hopefully keep all you lovely readers coming back again and again. And while we're on the subject folks, I'd like to say a big thanks for putting up with me thus far, your continuing support and encouragement means so, so much. Mucho Love Guys. 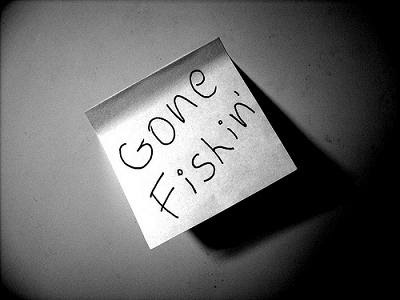 So my dear readers, until my dear ol' lappy is back in my arms again, just take it that im gone fishin'! Note: there will actually be no fishing of any kind done in my absence. 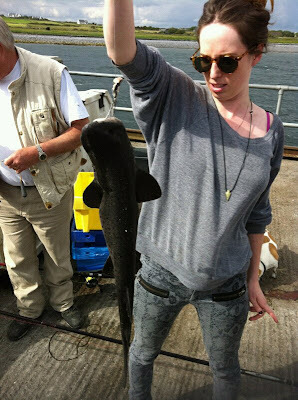 As my expression in the below photo clearly illustrates, I do not seem to enjoy fishing very much.